"Three weeks after the release of Morrissey's World Peace Is None Of Your Business (#2 UK, #14 US), Capitol Records/Harvest have ended their relationship with Morrissey, as directed by label boss Steve Barnett. Morrissey is once again in search of a record label." 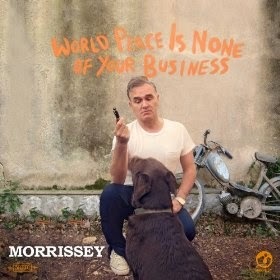 "Billboard has confirmed that Morrissey is still under contract with Harvest, the label behind his most recent album, World Peace Is None of Your Business. A source close to the situation tells Billboard that Moz has not been dropped by Harvest/Capitol, and that his contract with the company calls for two releases, the first of which was World Peace." "In response to Andrew Flanagan's incorrect report for Billboard online (15 August 2014), both Morrissey and Morrissey's lawyer are in possession of email correspondence from Steve Barnett (head of Capitol-Harvest Records), and also from Steve Barnett's personal assistant, both of whom confirm that Capitol-Harvest have ended their relationship with Morrissey. No recording Agreement with Capitol-Harvest was ever signed by Morrissey, and Morrissey retains full ownership of World Peace is None Of Your Business. Contrary to the assured Billboard report, Capitol-Harvest have very clearly stated that they would have no interest in licensing a second album by Morrissey. Russells (London), who represent Morrissey, are presently concluding Morrissey's relationship with Harvest Records. Once again, Morrissey is in search of a new label." Morrissey no longer appears on the official Harvest Records' website.